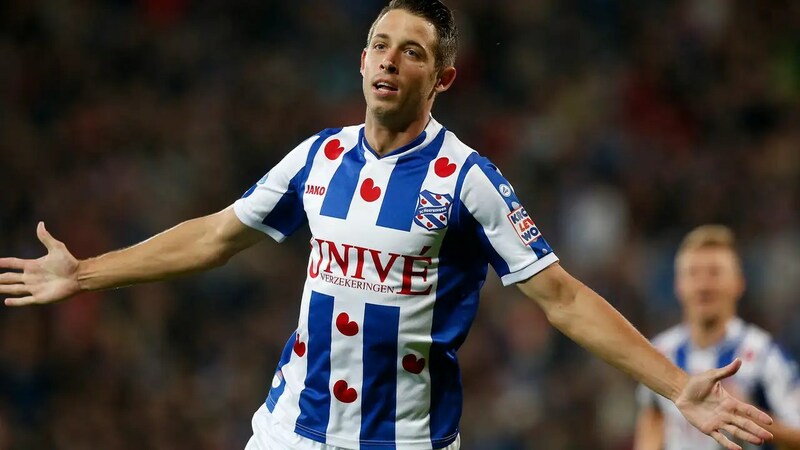 Life after Ziyech, Basacikoglu and Finnbogason looks rosy for Dwight Lodeweges’ Heerenveen after young striker Mark Uth netted a hat0trick to dispatch Utrecht 3-1 in Saturday’s late game writes Will Burns. The hosts exploded out of blocks and were ahead after just three minutes after shrewd play by Joey van der Berg. The midfielder was standing over a set piece on the right-wing and spotted Mark Uth running through to goal. Van der Berg took the free-kick quickly and Uth creatively spun marker Gevero Markiet and finished coolly. Utrecht lost Jens Toornstra to Feyenoord last week but added Swedish winger Kristoffer Peterson from Liverpool on a four-year deal. The 19-year-old nearly announced his arrival in style after turning with Pele van Anholt with ease before a popping a shot straight at Kristoffer Nordfeldt. Nordfledt’s opposite number Robbin Ruiter was substitute just before the half-hour mark for the veteran Jeroen Verhoeven, after the keeper pulled his groin taking a big boot up field. Yassin Ayoub came close before half-time after clipping the crossbar with a shot from the edge of the area as American forward Rubio Rubin forced Nordfeldt hand too but it was Heerenveen that nearly extended their lead before the interval. Daley Sinkgraven and Sam Larsson combined well and set-up Luciano Slagveer in the area. Slagveer took his time setting a shot up and Christian Kum, Utrecht’s signing from Heerenveen in the summer, slided in to clear in a potential goal-saving tackle. After Uth missed a great chance to give the hosts a further advantage, Utrecht’s Willem Janssen was denied by Nordfeldt after the midfielder powered a header at goal from Peterson’s cross. Just minutes later, Heerenveen were two goals up. Larsson and Slagveer’s speed was opening Utrecht’s back four up but it was Mark Uth who notched his second goal. Slagveer spotted Uth pulling away from Ramon Leeuwin and the striker had plenty time to chip a composed finish over the onrushing Verhoeven to make it 2-0. Willem Janssen grabbed a consolation goal in stoppage time before Uth added a third to seal his hat-trick. HEERENVEEN: Nordfeldt, Marzo, Otigba, Van Aken, Van Anholt, De Roon, Van den Berg, Sinkgraven, Slagveer, Larsson, Uth. SUBS NOT USED: De Fockert, Thorsby, Dalgaard, Schmidt, Raitala, Wildschut, Lumu. GOALS: Uth 3, 54 & 90+4. BOOKINGS: Marzo 45, Van den Berg 89. UTRECHT: Ruiter, Van der Maarel, Kum, Leeuwin, Markiet, Ayoub, Janssen, Kali, Oar, Peterson, Rubin. SUBS NOT USED: Verhoeven, Barazite, Diemers, Sarota, Cortie, Antwi, Kallon. BOOKINGS: Ayoub 20, Leeuwin 60.